I can’t endorse this product highly enough. As a freelance 3D animator I have a 60″ wide workstation with two monitors taking up all of that space. I’ve wanted to explore a standing desk for health reasons but at that size cost was out of the question. When I learned of this option I took a chance on two of them, and I am so glad I did. I’ve been using them for several days now and they are rock-solid and a perfect solution for my workspace. I did have some confusion during setting up the first one but the videos on the Ergodriven web site cleared that up within seconds and I was on my way. Setting up the second one was trivially easy. Just getting out of training for a new job, and right after they assigned us our cubicle, this is the first thing that went up! 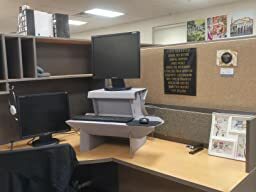 I’m 5’6″ and my cubicle desk is… whatever the usual is? I’ll measure later. But the main thing is, this is the perfect height for both line of sight and typing. One of my darling coworkers tried it out and didn’t find it as comfortable, but we lovingly call him The Hobbit, so he likely needs the Small model. Very sturdy, and easy to put together (if you pay attention to the instructions). Wish there was a discount for buying in bulk, because after just one week, almost my whole office is asking where to get one to try it themselves. The only con is that we’re a dual monitor office space and while I only got one to try it out, I have doubts about getting a second one. I won’t need the extra keyboard/mouse shelf, but there’s no way to assemble it soundly without it. Also, two might be too bulky, considering I will be sitting down from time to time and there’s no way to quickly collapse these and move them to the side. Saw a note on the creator’s site that he might be releasing a dual monitor version. If that comes to pass and it’s as affordable and well-designed as this one, sign me up! In the meantime, I’ll likely just use something more sleek and multifunctional as a riser for my second screen. 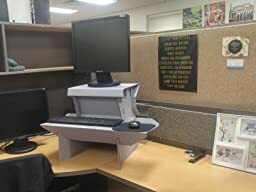 I just got it this morning and assembled it at the office. 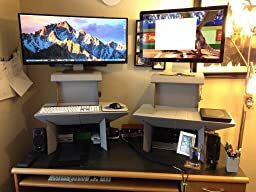 It’s okay for a intro level standing desk, cheap and sturdy enough. It squeaks, whenever I rest my hands on the “keyboard and mouse” area. It does tend to wobble my screen whenever I’m typing. It’s not that bad and I barely notice it, but it does wobble. It is hollow, which is understandable since it is cardboard cutouts, but this is what I think contributes to the wobble, my suggestion would be to have a “crossbar” or “brace” like the ones you see in chairs so it’ll help stabilize it. I would’ve like a bigger “keyboard and mouse” area, while I understand a bigger “keyboard and mouse” area might have durability issues. It makes it hard to have a bigger keyboard, or keyboards with those wrist rests. Same thing goes with the mouse, granted I’m in the office. I would like one at home where I can use my bigger “gaming” mouse pads. 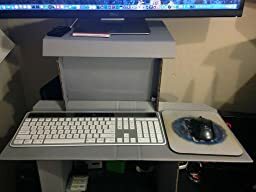 I got the medium one, I’m 5’7” and my monitor is right on my eye level, and keyboard and mouse just a 45 degree bend on my elbows.